Situated at the confluence of the Caribbean Sea, the North Atlantic Ocean, and the Gulf of Mexico, Cuba is one of the most prominent island countries for tourists all over the world. Known for its sugar-white beaches, world-renowned cigars, 1950’s classic Cadillacs, and a vibrant culture, Cuba is blessed with postcard-perfect beauty that comprises a pristine coastline, gorgeous mountains, and a diverse ecosystem. The largest island in the Caribbean, Cuba was discovered by Christopher Columbus in 1492 and has come a long way since then. Usually pretty economical as compared to other Caribbean islands, Cuba has an amazing live music scene that can be experienced at almost every other street, especially at Casa de La Musica – every Cuban town has one of these where locals and tourists come together to salsa the night away. Let us now take a look at some of the most popular neighborhoods so you can choose where to stay in Cuba when you visit. The capital city of Cuba, Havana is what most visitors think of when they plan a trip to this wonderful island country. The city was a tourist hotspot before the Communist movement, however, since tourism regained the platform here in the 1990s, Havana has been nothing less than a traveler’s delight. A usual day in Havana includes walking through the historic streets of Old Havana, admiring some fascinating natural attractions, sipping on icy cocktails, and dancing to the tunes that fill the air. 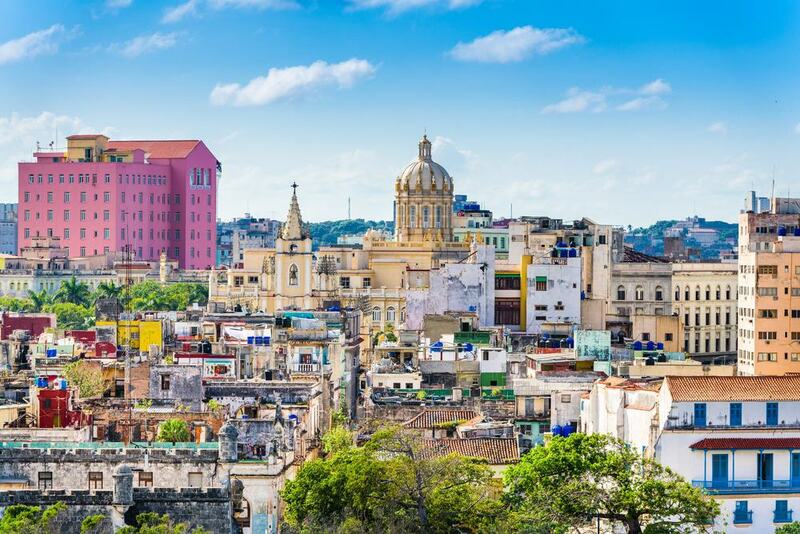 Old Havana, the beating heart of Havana, is where you’ll find cobbled streets, gigantic mansions, historic-homes-turned-museums, and frescoed churches. Though signing up for a Havana Classic Car Tour is the most stylish way of exploring the neighborhood, you could easily walk your way around to explore the endless restaurants, cafes, prominent structures, and beachfronts. Malécon, a historic stone by the oceanfront, is the socialize central of Havana, for locals and tourists alike. While here, don’t miss the “El Cañonazo de Las Nueve” ceremony at the La Cabana fortress – a daily ceremony indicating the closing of the city gates. Other Highlights: El Floridita, Camera Obscura, El Floridita, Morro Castle, Museum of the Revolution, El Capitolio, Castillo de la Real Fuerza, Gran Teatro de La Habana, and Palacio de Los Capitanes Generales. Melia Cohiba – Located in the vibrant neighborhood of Havana, Melia Cohiba offers a world-class service overlooking the sea. Guests stay at one of the many well-appointed rooms and suites which are equipped with amenities such as free Wi-Fi, flat-screen TV with cable, minibar, and private bathroom with hot tub. Additional facilities at the hotel include a spa and wellness center, an outdoor swimming pool, multiple wining and dining options, a fully-equipped business center, and a fitness center. A complimentary breakfast is served daily. Great for all kinds of travelers. NH Capri La Habana – Situated in the center of downtown Havana, this splendid property features a rooftop outdoor pool with spectacular views of the surroundings, a fitness center, multiple restaurants and bars, and a Turkish bath. Guestrooms are fitted with flat-screen TV, seating area, and ensuite bathroom. A fabulous complimentary breakfast is served daily. Perfect for all kinds of luxury travelers. Hotel Nacional de Cuba – Featuring an on-site bar and restaurant, a 24-hour front desk, a fitness center, and a swimming pool, Hotel Nacional de Cuba is one of the finest hotels in Havana. The property features wonderfully-designed, spacious guestrooms with comfy beds, cable TV, free Wi-Fi, and an ensuite bathroom with free toiletries. A superb complimentary breakfast is served daily. Great for all kinds of travelers, including big groups of up to 6 members. Havana may be the capital and the most prominent city in Cuba but spending a few nights in Trinidad definitely brings you face to face with the country’s colonial gem. 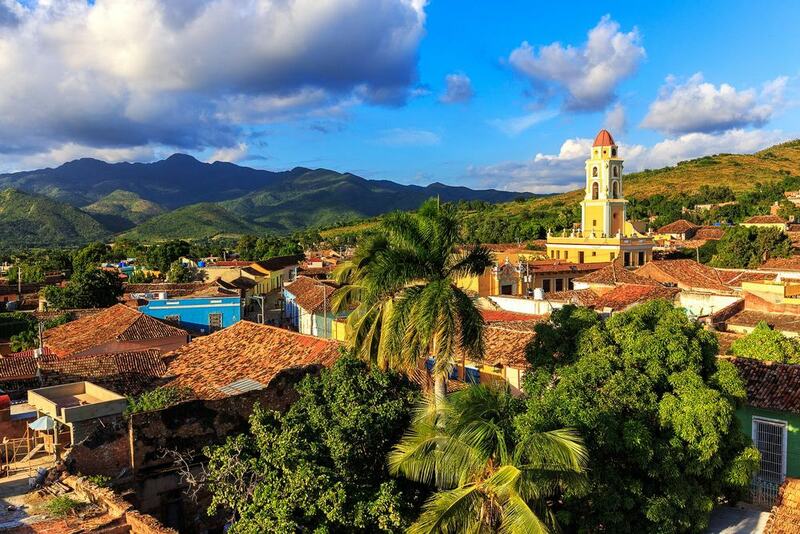 Undeniably the best-preserved colonial town in Cuba, the old part of Trinidad has been accredited as a UNESCO World Heritage Site since 1988. Like any other town of its kind, the streets of Trinidad are filled with brightly colored homes and cobblestone streets. Plaza Mayor, the core of Trinidad, is home to several historic structures, including Museo de Arquitectura Colonial and Galeria de Arte. The eye-catching yellow and green bell tower of Museo Nacional de Lucha Contra Bandidos is a sight to admire. Another prominent attraction around Trinidad is Playa Ancón – a small fishing town with some of the best beaches and weekend parties in Cuba. An hour’s drive from the town, you could find a lot of gorgeous waterfalls – Salto del Caburni, at 75 meters high, is one of the most famous. Other Highlights: Museo Romántico, National Museum of the Struggle Against Bandits, Colonial Architecture Museum, Museo Historico, Palacio Cantero, and Convento de San Francisco de Asís. Dona Antonia And Friends Rooms – A charming bed and breakfast in Trinidad, Cuba, Dona Antonia And Friends Rooms offer well-appointed guestrooms with facilities such as air-conditioning, wardrobe/closet, seating area, and private bathroom with free toiletries. Guests can relax in the shared lounge or go cycling in the area. A fabulous complimentary breakfast is served daily. Suitable for all kinds of travelers. Cubata And Friends Rooms – Featuring a terrace that overlooks the beautiful neighborhood, Cubata And Friends Rooms feature, spacious, well-decorated guestrooms with facilities such as kitchenette, wardrobe, air-conditioning, cozy beds, and private bathroom with free toiletries. A delightful complimentary breakfast is served daily. Great for all kinds of travelers. Pepe and Friends rooms – Boasting a well-manicured garden, a communal lounge, and on-site dining facilities, Pepe and Friends Rooms provide spacious, simplistic guestrooms with facilities such as air-conditioning, wardrobe/closet, a work desk, and private bathroom with free toiletries. A complimentary breakfast is served daily. Suitable for all kinds of travelers. One of the largest resort towns in the Caribbean Islands, Varadero stands strong at the pinnacle of Cuba’s tourism business. A narrow, uninterrupted stretch of blond sand that expands over 20-kilometers, the beachfront at Varadero is sprinkled with at least 60 all-inclusive beach resorts and several other beachside entertainment avenues, including restaurants, shops, and water activities. In addition to its crown jewel, Varadero Beach, the town is home to quite a few captivating cave systems, historical and cultural attractions, and accessibility to a chain of virgin cays. Parque Josone, a beautiful lake built in the 1940s for a park owner and his beloved wife, is a great place to visit with the family. Appreciate the well-manicured gardens, paddle around the lake, and spot ducks as you stand on the bridge to admire the views. On the eastern tip of Varadero is Reserva Ecológica Varahicaco, a preserve with great walking trails and a prehistoric burial cave. Other Highlights: Parque Josone, Cueva de Ambrosio, Cueva de Musulmans, Delfinario, Cayo Piedra Underwater Park, Varahicacos Ecological Reserve and Cueva de Saturno. Royalton Hicacos Adults Only – All Inclusive – Located right along the beach, this wonderful oceanfront adult-only, all-inclusive hotel features a stunning outdoor pool, an on-site restaurant and bar, a fully-equipped fitness center, a full-service spa and wellness center, a swim-up bar, and multiple lounge areas. The luxurious guestrooms are fitted with an extra-large double bed, minibar, TV with satellite channels, and an ensuite bathroom. Perfect for solo travelers and couples. IBEROSTAR Varadero – Boasting an outdoor pool, a rejuvenating spa and wellness center, a children’s playground, a world-class fitness center, and an on-site restaurant and bar, IBEROSTAR Varadero is an all-inclusive property located a stone’s throw away from the beach in Varadero. Rooms here are equipped with cable TV, coffee machine, and ensuite bathroom. Great for all kinds of travelers. Roc Arenas Doradas – Rooms and suites at Roc Arenas Doradas offer cable TV, safety deposit box, and a terrace area. Guests can enjoy at the year-round outdoor pool or work it out at the fully-equipped fitness center. Families can leave their kids at the dedicated children’s playground while they enjoy a drink at the bar. Golfing and snorkeling are popular activities around the place. Tariffs are all-inclusive of all meals. Suitable for all kinds of travelers. 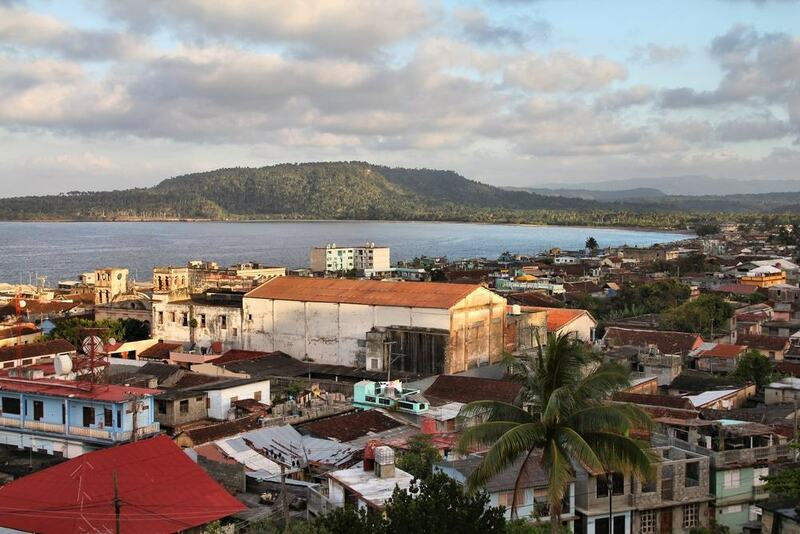 The first capital of Cuba and the oldest Spanish settlement in the country, Baracoa is often considered the island’s best-kept secret. Flushed by 29 rivers, impregnated with swaying palms, and crowded by coffee bushed and chocolate trees, Baracoa’s deep green foliage is unsurpassable. The world’s smallest bird, frog, and bat choose to live in the tranquility of this coastal neighborhood. Houses here are mostly small and constructed out of food and the atmosphere oozes the charm of a usual, insignificant village. But, those who have made the effort to come to the eastern end of Baracoa know that this place is anything but insignificant. The plazas at Parque Independencia and Parque Marti (busier) are the two most prominent rendezvous points in the area. Christopher Columbus himself watches over the neighborhood from Playa Boca de Miel, the main town beach of Baracoa. Parque Nacional Alejandro de Humboldt, a UNESCO Heritage Site known for its biodiversity, is a great place for trekking. While here, you absolutely can’t miss a visit to El Yunque National Park and Mountains. Other Highlights: Museo Municipal, Catedral de Nuestra Señora de la Asuncion, Cruz de la Parra, and Museo Arqueologico la Cueva Del Paraiso. BR& Casa Jose – Featuring a beautiful garden and a well-stocked bar, BR& Casa Joe offers well-appointed guestrooms with facilities such as TV, tea/coffee maker, minibar, kitchenette, and private bathroom. Every room here is equipped with a balcony with fabulous views of the sea. A complimentary continental breakfast is served daily (with selected room packages). Perfect for solo travelers, couples, and small families. Hostal Casa la Fortaleza – This bed and breakfast is the heart of Baracoa provides well-furnished guestrooms with wardrobe, dining area, and private bathroom. The property also has a shared lounge for guests to relax in and a 24-hour front desk to handle all their queries. Airport transfers can be arranged on request. Suitable for solo travelers, couples, and small families. Casa Mari – Located at a couple of minutes’ walking distance from the beach, Casa Mari offers well-equipped apartment units with soundproofing, flat-screen TV, barbecue facilities, seating area, kitchenette, outdoor dining area, and ensuite bathroom. An optional continental or American breakfast is available daily. Great for couples, families, and big groups. Santa Clara, the capital of Villa Clara, a province in Cuba, is located almost in the center of the island country. 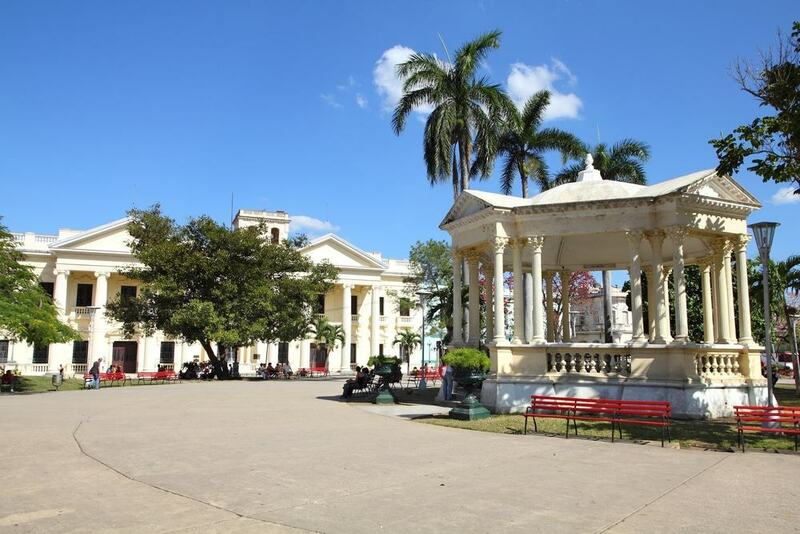 The 5th most populous city in Cuba, Santa Clara has been known by many different names ever since it was founded in 1689 by a group of 175 people. Havana may be at the epicenter of all Cuban mainstream travel, Santa Clara, however, is arguably the most revolutionary city in Cuba. The town is literally obsessed with Che Guevara, an Argentine doctor turned guerrilla leader who attacked the city during the Cuban Revolution of 1958. A neighborhood bustling with the latest trends and insatiable creativity, Santa Clara hosts the only official drag show in Cuba and is home to Ciudad Metal, the best rock festival on the island. Other Highlights: Monumento a la Toma del Tren Blindado, Statue of Che Guevara, Catedral de Santa Clara de Asís, Museo de Artes Decorativas, Leoncio Vidal Park, and Loma Del Capiro. Los Caneyes – Boasting a well-manicured garden, a fully-stocked bar, and a multi-cuisine restaurant, Los Caneyes offers fully-equipped villas with comfy double beds, air-conditioning, safety deposit box, and private bathroom. Guests can spend their time unwinding themselves at the open garden space or explore the area. Great for solo travelers, couples, and small families. Hostal Cary Y Lazaro – Set within a beautiful Cuban home, Hostal Cary Y Lazaro features wonderfully-decorated guestrooms with modern facilities such as air-conditioning, wardrobe/closet, patio, and a private bathroom. Each room is equipped with a terrace. A superb continental breakfast is available daily. Perfect for all kinds of travelers. Hostal Francisco – Featuring a charming patio and a wardrobe, every room at Hostal Francisco comes with tile/marble floor, refrigerator, dining area, and private bathroom. Rooms here either overlook the surrounding gardens or the city. Theater La Caridad is just a kilometer from the property. Suitable for solo travelers, couples, and small families. The second largest city in Cuba and the capital of the province by the same name, Santiago de Cuba is undoubtedly the second-most important city on the island, Havana being the first, of course. Nonetheless, Santiago de Cuba is recognized for its vibrant culture. 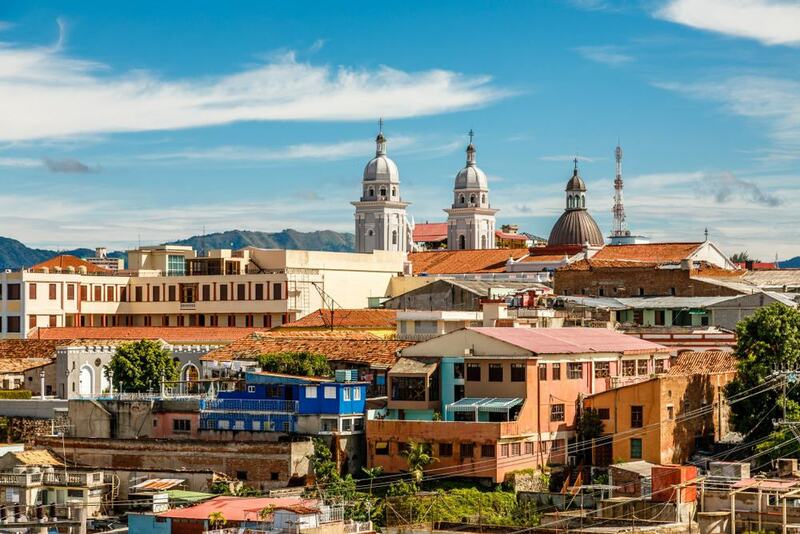 The birthplace of José María Heredia, an extremely distinguished man who was considered to be the initiator of Latin American romanticism, Santiago de Cuba’s cultural life is filled with world-famous musicians, traditional dances, and larger-than-life carnivals. Bacardi, the globally renowned alcohol brand, originated in Cuba in 1862. There is a now a museum dedicated to Facundo Bacardi Masso and his family’s extensive art collection. Set in a dramatic landscape with the mountains of Sierra Maestra (the largest on the island), and the vast azures of the Caribbean, Santiago de Cuba is often known as the “Hero City of Cuba.” This town gave birth to son and bolero and has nurtured some of the most-distinguished Cuban musicians of all times. If you get too overwhelmed with all the drinking, dancing, and singing, pay a visit to Castillo de San Pedro de la Roca, an impressive 17th-century fortress overlooking the bay that houses a pirate museum and offers unprecedented views of the ocean. Other Highlights: Baconao, Turquino National Park, Basílica Santuario Nacional de Nuestra Señora de la Caridad del Cobre, Museo Emilio Bacardí Moreau, Casa de Diego Velazquez, and Parque zoológico de Santiago de Cuba. Villa Azul: Yusmila – A short drive from Antonio Maceo International Airport, this pleasant property offers well-furnished guestrooms with air-conditioning, electric blankets, kitchenware, dining area, and private bathroom. The friendly staff at the 24-hour front desk can help guests with tips on local attractions and excursions. Suitable for solo travelers, couples, and small families. Villa Greta – Guestrooms at Villa Greta come with flat-screen TV, safety deposit box, seating area, kitchenette, outdoor dining area, and a patio. Most rooms overlook the city or the surrounding gardens. Las Guasimas Battlefield and Antonio Maceo International Airport are both a short drive away. Suitable for solo travelers, couples, and small travelers. Melia Santiago de Cuba – Boasting an outdoor pool, a state-of-the-art fitness center, a shared lounge, and a delightful restaurant and bar, Melia Santiago de Cuba features opulent guestrooms and suites with avant-garde amenities such as safety deposit box, flat-screen TV, minibar, and ensuite bathroom. An exceptional complimentary breakfast is served daily. Perfect for all kinds of travelers. 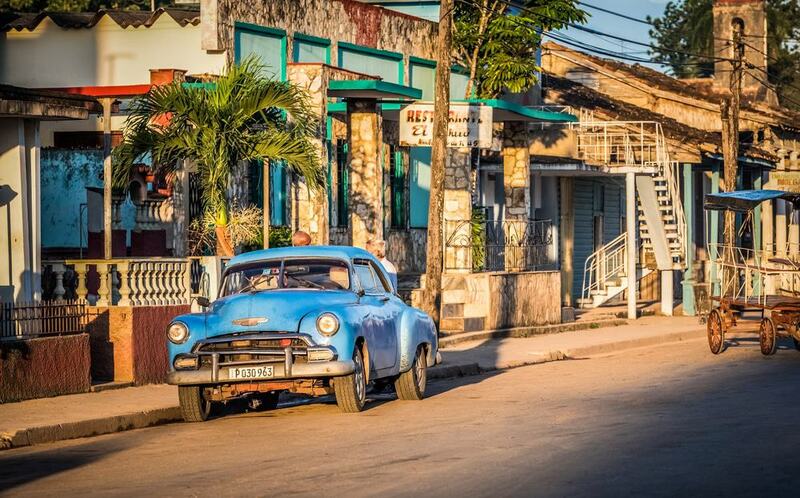 Despite being on the tourism radar for a very long time, Viñales has a slow, laid-back atmosphere that emanates traditional Cuban charm along with an air filled with the essence of a Cuban cigar. 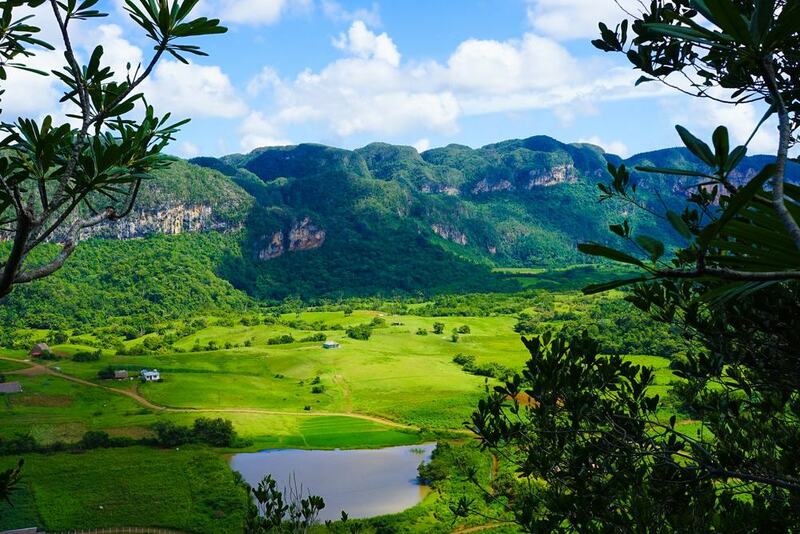 Primarily an agricultural area, Viñales is where Cubans grow their coffee, fruits and vegetables, and tobacco using the age-old methods of farming. Fishing is also a significant part of the area’s economy. Viñales Valley, a UNESCO Site since 1978, is recognized for its extraordinary landscape as well as native crafts, music, and architecture. One of the best ways to explore the neighborhoods unending greenery and agricultural gems are to take a horse ride and passage through the lush valleys and tobacco plantations. Cuevas de Santo Tomas is the largest cave system in Cuba and the second-largest in the American continent and can be either explored by foot or by a short boat ride that takes you through the unique cave system – expect to see stalagmites, stalactites, bats, intriguing rock formations, and a replica of a prehistoric native Indian mural. Other Highlights: Indian Cave, Museo Municipal, Jardin Botanico de Vinales, Centro Cultural Polo Montañez, Mural of Prehistory, and Museo Municipal Adela Azcuy. Casa Yolanda y Pedro – Guestrooms at Casa Yolanda y Pedro come with comfy double beds, air-conditioning, closet, and private bathroom with towels. The helpful staff at the property can help arrange for airport transfers. Guests with their own vehicles can make use of the on-site free parking. An optional continental breakfast is available daily. Great for families and groups. Casa Los Complacientes – Located in the traditional Cuban neighborhood of Viñales, Casa Los Complacientes offers comfortable guestrooms with cozy beds and linens, air-conditioning, and a private bathroom with shower. Every room at the property is equipped with a wardrobe. Airport transfers can be arranged by the hotel staff. A continental breakfast is available every morning for a nominal cost. Suitable for families and groups. La Ermita – Surrounded by lush greenery, La Ermita features well-appointed guestrooms with safety deposit box, minibar, telephone, and private bathroom. All the rooms at the property come with a TV and a work desk. Guests can make use of the free parking on-site and enjoy their meals at the in-house restaurant. Perfect for all kinds of travelers. A beach town at the head of the famous Bay of Pigs (Bahía de Cochinos), Playa Larga is a part of the Peninsula National Park and is enclosed by the encompassing Zapata Peninsula, the largest wilderness area in Cuba. 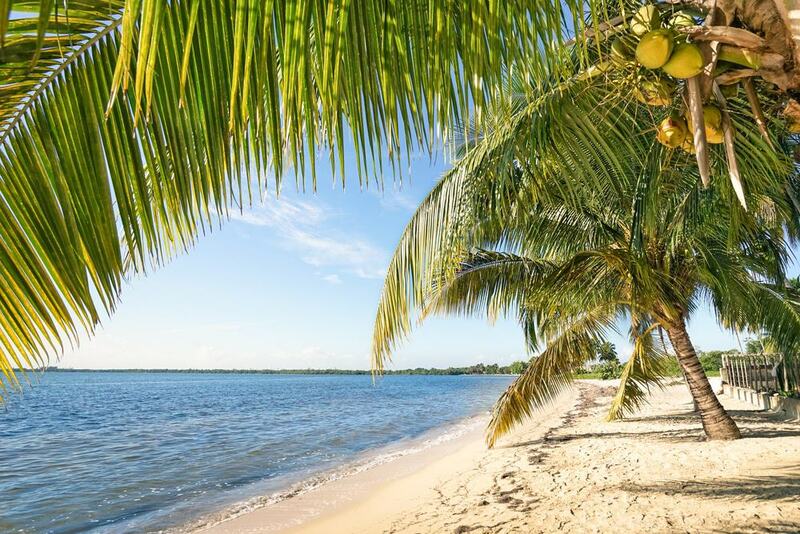 Far away from the urbanization and population of Havana and Trinidad, Playa Larga is a quintessential beach town with a beauty that is unmatched to any other. The perfect combination of greens and blues fill the neighborhoods coastline as ecotourism enthusiasts venture through the many flora and fauna species, mangroves, and cave systems in the area. Once you’ve exhausted all the activities that the town has to offer, namely scuba diving, snorkeling, fishing, and visiting flooded caves, book yourself a guided tour of Zapata National Park and immerse yourself in the ultimate Cuban wilderness. Alternatively, you could head over to the beach and witness the routine crab invasion that takes place every evening. Later, head over to Casa Tiki for the best seafood dinner you might ever try. Other Highlights: Punta Perdiz (snorkeling or diving), Zapata Peninsula and National Park, Cueva de los Peces (open-sea diving), Hatiguanico River (fly fishing), Las Salinas de Brito, and Crocodile Breeding Centre. SB Gran Hostal Playa Larga – Just a minutes’ walk from the beach, SB Gran Hostal Playa Larga is one of the most sought-after properties in the neighborhood. All the guestrooms at this hotel come equipped with comfortable double beds, air-conditioning, private entrance, outdoor dining area, and private bathroom. Guests can enjoy a view of the river or the sea from their balcony (in selected rooms). An optional breakfast is available daily. Perfect for all kinds of travelers. Casa Tiki – Featuring spacious, air-conditioned guestrooms with brilliant facilities such as safety deposit box, private entrance, seating area, minibar, and ensuite bathroom, Casa Tiki offers striking views of the neighboring waters. Guests can relax at the well-manicured gardens around the property and relish delicious meals at the on-site restaurant. Hiking and fishing can also be enjoyed around the hotel. Great for all kinds of travelers. La Casita del Puerto – Located next to a charming lake, La Casita del Puerto provides well-appointed guestrooms with air-conditioning, private entrance, seating area, and private bathroom. Airport transfers can be requested at the property. An optional continental breakfast is available daily. Great for families.